Bad boys bad boys, whatcha you gonna do whatcha you gonna do when they come for you…. According to both news reports Les doesn’t want to protect the tax payers financial interest by placing the Bond Holders on notice. Obviously he isn’t worried about fulfilling the contractual agreement to report a claim or the possibility of a claim. Personally I feel he is culpable with the Police Chiefs going rogue. Of all the things he is accused of being a good steward of the tax payers interest isn’t one of them. Les n Lil Daddy Said have some hard decisions to make in the coming weeks. However, the mayor believes the council is acting “prematurely” by filing notices with the bonding companies and said he will likely veto its decision. Slabbed was there as was WLOX and the Seacoast Echo. The latest meme out of the Fillingame camp involves asking the rhetorical question Who is the Hancock County Alliance for Good Government? It is the exactly the meme the Library folks whipped out after Slabbed pointed out that the Library system and its supporting Foundation had spent $2,400 to Gold sponsor the annual Chamber of Commerce gala, a night of recognition, revelry complete with firewater less than a year after closing East Hancock County Library citing a lack of funds. Since the ideas can’t be refuted when all else fails attack the messenger. A clue for you Facebook Warrior hens, it is possible have an organization without a Facebook page. As an experienced webmaster I’d personally recommend organizations steer clear of Facebook because the company plays too many games with its news feed but that is another post. The Denardo surname was a patronymic name, created from the personal name Nardo, which was in turn, a shortened form of Bernardo. The surname Denardo was first found in the Kingdom of Naples, formerly Napoli or Neapolis, in southern Italy. There is also a city of Nardò in the province of Lecce, that dates from the Baroque era. Belisario Acquaviva, a nobleman and writer from the Kingdom of Naples became the first Duke of Nardo (Duca di Nardò) in the 15th century. It no secret that Chief was ethically Italian which is why I wondered why his spelling of his surname would the use the French preposition “de” instead of the Italian equivalent “di” as shown above at House of Names. Maybe Chief changed how he spelled his last name after landing in some hot water over in St Tammany because in the Bay he did spell it “De Nardo”? Or maybe it was another reason. Whatever the reason, there is a younger man by the same name in Wallkill New York that uses the conventional spelling and I have a few press reports that illustrate it. I’m writing this post specifically for one group of people, Bay St Louis City employees that knew what was going on and decided to go along to get along in order to keep their jobs. “I was only following orders” is not a legal defense. Knowing of the commission of a crime and doing nothing is itself a felony. 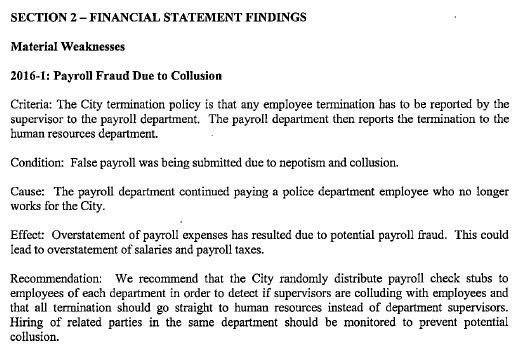 As a matter of editorial policy, Slabbed New Media is calling for the immediate prosecution of any and all Bay St Louis City Employees that had knowledge of, or any involvement in the payroll fraud alleged by Hancock County Sheriff Ricky Adam. Mayor Les Fillingame in recent statements in the local news media has confirmed that he suspended without pay, late Bay St. Louis Chief of Police Michael De Nardo, because the Mayor had been informed by the Hancock County Sheriff Ricky Adam that De Nardo, was the subject of an investigation. The Hancock County Sheriff’s Department has now confirmed that the City of Bay St. Louis Payroll Department is the subject of a Federal investigation for Payroll Fraud. Using the same premise under which Mayor Fillingame suspended Chief De Nardo without pay, we are asking the Bay St. Louis City Council to request Mayor Fillingame, Payroll Clerk Pat Tice, Acting City Clerk Paula Fairconntue, Comptroller Sissy Gonzales, Human Resource Director Gus McKay, and any other city employees or elected officials who either prepare or present payroll and benefits for Council approval, to step down without pay until the Payroll Fraud investigation by the FBI is concluded. If the aforementioned publicly compensated individuals will not voluntarily step down, we are asking the Council to call a Special Meeting and suspend their pay and remove them from their positions immediately and until the investigation is completed. Asked about possible reasons the chief may have taken his life, he said De Nardo had been “reeling from the death of his mother,” was in a state of personal grief. Eubanks said De Nardo is survived by his mother in New York; his wife Patricia; his son Michael, Jr.; his step-daughters Eubanks and Ashley Baradell; nine grandchildren; one great-grandchild; sisters; uncles; and aunts.